Crane mats are designed to provide a foundation, a base, from which construction cranes operate. to navigate, quality crane mats are brought in so that the crane has a solid foundation to rest on. 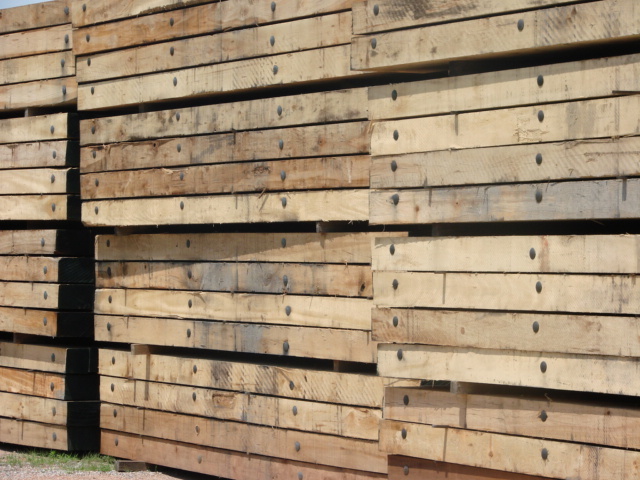 edwards Wood Products offers a wide variety of quality Crane Mats produced from various species. These species include mixed hardwood, Hickory and Oaks. These mats are built on site by experienced employees, working hard to meet our customer's needs. edwards Wood Products manufactures over 650 crane mats per week at our Marshville, NC facility. We use 1" bolts and produce exposed bolt mats with all washers and nuts always countersunk. We have rail car access and our own fleet of trucks to ensure we can deliver the best crane mats to our customers whenever and wherever needed. 6" - 8" - 10" - 12"
Let edwards Wood Products provide your Crane Mats for you.